What types of pottery do you find especially challenging? 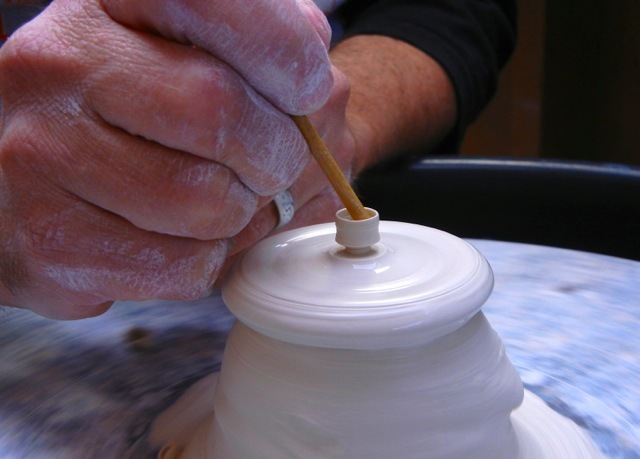 Forming miniatures on a potter’s wheel requires much more concentration and focus than forming ‘life-size’ pottery. I move slowly and precisely in a cubic inch of space allowing my fingertips and a wooden dowel to stretch and expand clay from a solid wet spinning mound. 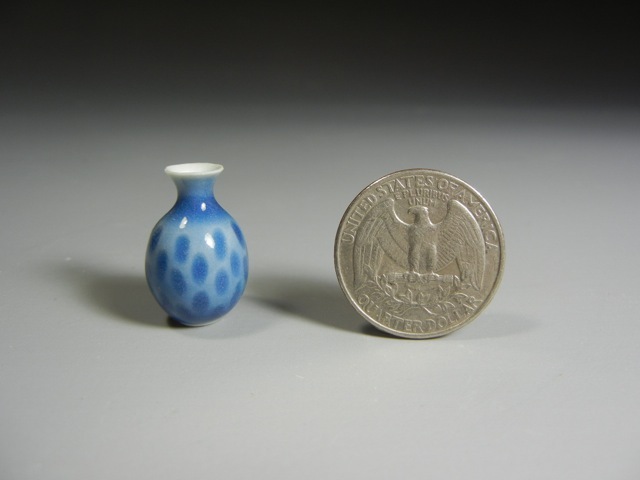 The process of throwing miniatures on a potter’s wheel however is the easiest part of the process. After they are thrown, I trim the foot-ring, add handles and spouts, carve decorations, etc. These things are all more difficult than the throwing process itself. But the most difficult thing for me is the glazing. Glazes are dipped, poured and brushed on the vessels and then portions are scrapped off to thin the glaze layer before firing in a kiln. If the glaze is too thick the glaze might run off the pot destroying it. If the glaze is too thin, the colors will be bland and uninteresting. After all the work that precedes the firing – this last step results in a number of losses. Making compound forms such as teapots are the most challenging due to the increased number of steps. Making a teapot means throwing the vessel, throwing the spout, making a well fitting lid and adding a handle – it is like making several simple vases. Teapots spouts are the smallest thing I throw and If the spouts aren’t thin enough they will look too ‘chunky’ and out of proportion. Do you have a favorite firing method? I love high-fired porcelain fired in reduction. 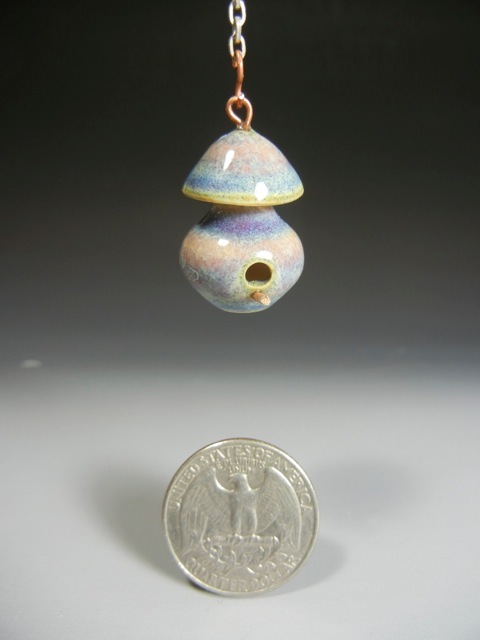 I fire most of my porcelain creations to about 2350˚F in a natural gas-fueled kiln. 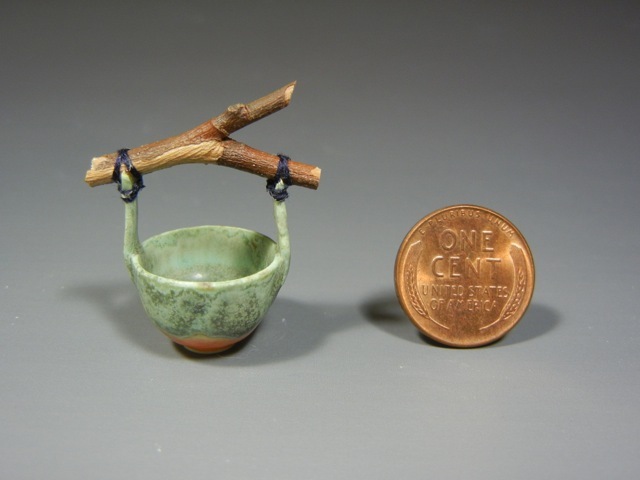 I first load it with life-size pottery and then place my miniatures around the larger pots. 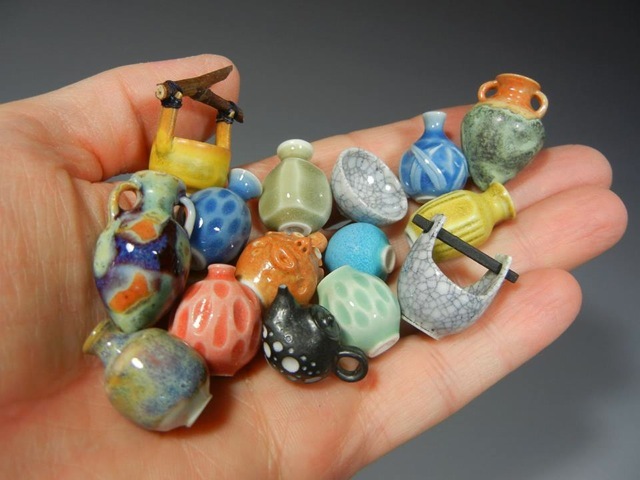 Do you have a favorite piece you’ve made? The most recent pieces to come out of the kiln are always my favorites. It is always a joyous thing to unload a warm kiln and see how each unique piece comes out. Not all of them survive but those that do make the whole process worthwhile. I am most inspired by antiques that I see in museums, books, and peoples’ collections. Experiment! Try everything even if it doesn’t work as intended, use the process to gain experience. Never stop playing, trying new things and pushing the limits. 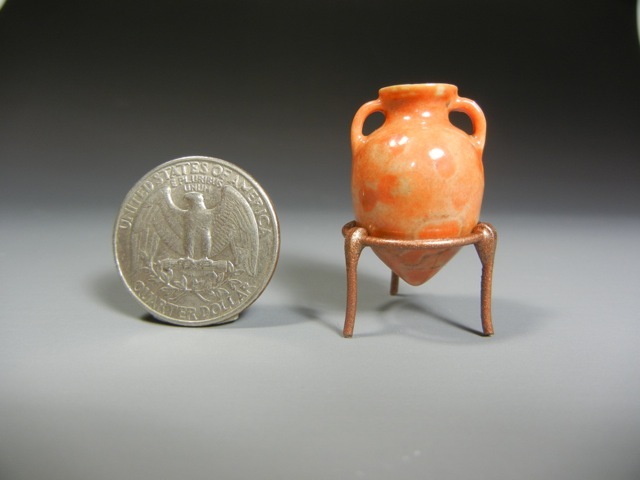 Red Dragon Pottery was created by potter Troy Schmidt from Goleta, California. Check out more of his creations (mini and full scale) by visiting the Red Dragon Pottery website. You can also follow along on Facebook, Instagram, Google+, YouTube and Pinterest!